For approximately 50 years up to 1966, millions of cubic metres of excavated mining debris from the National Coal Board’s Merthyr Vale Colliery was deposited on the side of Merthyr Mountain, directly above the township of Aberfan. Huge piles of loose rock and mining slag, known as tips, had been built up over a layer of highly porous sandstone that contained numerous underground springs, and several tips had been built up directly over these springs. Although local authorities had raised specific concerns in 1963 about slag being tipped on the mountain above the village primary school, these were largely ignored by the NCB’s area management. 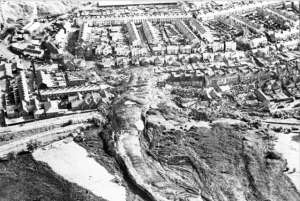 Early on the morning of Friday 21 October 1966, after several days of heavy rain, a subsidence of about 3-6 metres occurred on the upper flank of colliery waste tip No. 7. At 9:15am more than 150,000 cubic metres of water-saturated debris broke away and flowed downhill at high speed. It was sunny on the mountain but still foggy in the village, with visibility only about fifty metres. The tipping gang working on the mountain saw the landslide start but were unable to raise the alarm because their telephone cable had been repeatedly stolen — although the official inquiry into the disaster later established that the slip happened so fast that a telephone warning would not have saved any lives. 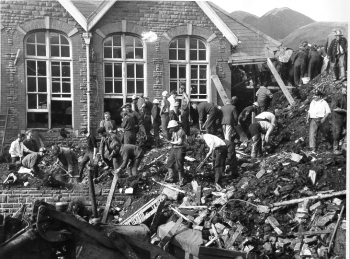 The slide destroyed a farm and twenty terraced houses along Moy Road and slammed into the northern side of the Pantglas Junior School and part of the separate senior school, demolishing most of the structures and filling the classrooms with thick mud and rubble up to 10 metres deep. Mud and water from the slide flooded many other houses in the vicinity, forcing many villagers to evacuate their homes. After the landslide there was total silence. George Williams, who was trapped in the wreckage, remembered: “In that silence you couldn’t hear a bird or a child”. After the main landslide stopped, frantic parents rushed to the scene and began digging through the rubble, some clawing at the debris with their bare hands, trying to uncover buried children. 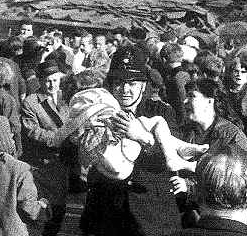 As news spread, hundreds of people drove to Aberfan to try and help with the rescue, but their efforts were largely in vain. Water and mud still flowing down the slope, as well as the growing crowd of untrained volunteers, hampered the work of the trained rescue teams who were arriving. A few children were pulled out alive in the first two hours, but no survivors were found after 11am that day. By the next day, Saturday, some 2000 emergency services workers and volunteers were on the scene. Some already on the scene had dug continually for more than 24 hours. Rescue work had to be temporarily halted during the day when water began pouring down the slope again. Because of the huge mass and consistency of the slag it was nearly a week before all the bodies were recovered. Bethania Chapel, 250 metres from the disaster site, was used as the temporary mortuary and missing person’s bureau from 21 October until 4 November 1966 and its vestry was used to house Red Cross volunteers and St John Ambulance stretcher-bearers. The smaller Aberfan Calvinistic Chapel was used as a second mortuary from 22-29 October and became the final resting-place for the victims before their funerals. Two doctors were charged with certifying the deaths and examining the bodies; the causes of death were typically found to be asphyxia, fractured skull or multiple crush injuries. A team of 400 embalmers arrived in Aberfan on Sunday and under police supervision they cleaned and prepared over 100 bodies and placed them in coffins obtained from South Wales, the Midlands, Bristol and even Northern Ireland. Because of the cramped conditions in the chapel/mortuary, parents could only be admitted one at a time to identify the bodies of their children. One mother later recalled being shown the bodies of almost every girl from the school before identifying her own daughter. The final death toll was 144; 116 of the dead were children between the ages of 7 and 10 — almost half of the children at the Pantglas Junior School, as well as five of their teachers. 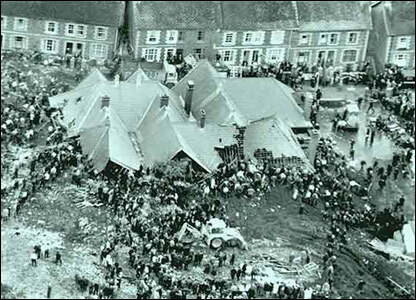 Most of the victims were interred at the Bryntaf Cemetery in Aberfan in a joint funeral held on 27 October 1966, attended by more than 2000 people.